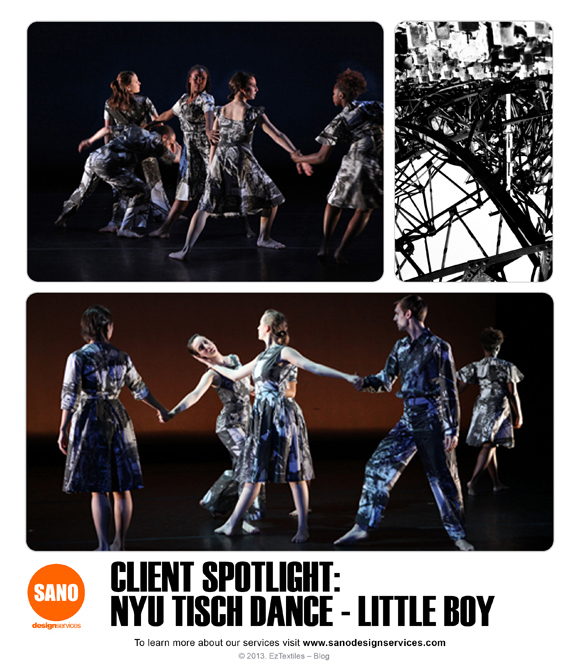 When we were approached by Mark Koss at NYU Tisch Dance, we were delighted to help with printing the fabric for his costume designs in their production of “Little Boy.” The intense black and white images printed onto lightweight cotton easily transformed into these gorgeous costumes below, under the direction of Mark. We’re thrilled to share this exciting application of digitally printed fabrics, and invite you to come print your own custom designs to sew up into any number of costumes you may think of! This entry was posted on Thursday, August 1st, 2013 at 10:02 am	and is filed under Art, Client Spotlight, Fabric Printing, Sano Design Services. You can follow any comments to this entry through the RSS 2.0 feed. You can leave a comment, or trackback from your own site.